We are currently facing a potentially nasty ice storm tonight into tomorrow. A fairly large low pressure will move northeast before transferring to the coast. Because the transfer is happening late, not enough cold air aloft will be available for snow. This means that snow totals will be very low in the immediate Philadelphia area, with higher totals North and West of the city. I am only expecting an inch or two at the most to fall before the freezing rain begins overnight. As many of you may or may not know, freezing rain occurs when the upper air in the atmosphere is warmer than freezing, but the temperature at the surface is below freezing. When this “rain” falls, it turns into ice on contact with any object on the ground: cars, trees, roads, and sidewalks. Uncertainty remains, however. At some point tomorrow, the temperatures will rise above freezing. But many computer models and forecasts are in disagreement when this changeover will occur. What makes this forecast complicated is the snow that is currently on the ground. The snow could keep our temperatures below freezing at the surface, even though computer models are projecting them to be different. This is what scares me in terms of tomorrow’s forecast. What is my prediction? 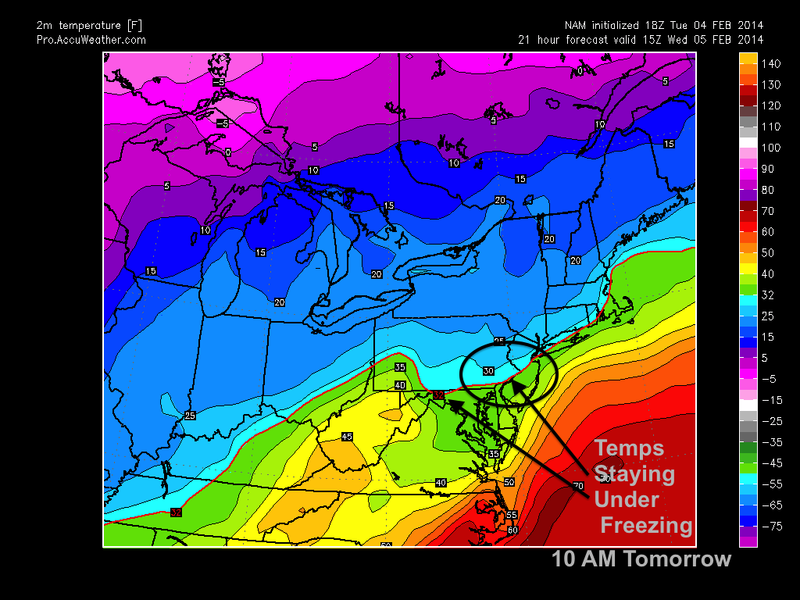 A major ice storm will occur from Philly northward and it may not change over until 11 AM or even later. Driving tomorrow morning will be treacherous as any untreated roads will be absolute ice slicks. The weekend is looking very interesting as a very large storm could possibly affect the area. If the storm ends up wrapping up and turning into a nor’easter, totals could be close to 12 inches or higher on Sunday. Right now, however, there is uncertainty where exactly the storm will wrap up along the coast. More on this storm later this week.